Opening Day Cards - Baseball Cards & Baseball News: David Ortiz Quote - "You Gotta Ride With Me"
David Ortiz Quote - "You Gotta Ride With Me"
When the big man speaks we listen. He spoke up big time and he's backing it up with some solid play and some big time hits. 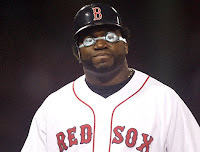 It looks like the Boston slugger is returning to his glory days of decent eyes and steroid use. David said - "I was mad. I was absolutely mad. If you ride with me, you're going to get two things. Either you're going to win or you're going to die with me. That's the way it is, that's the way it's been as long as I've been here. ... You gotta believe in your players. Period. You choose to have me on your roster since Day 1. You gotta ride with me." Somewhere Dustin Pedroia is sitting back and watching the laser show with a big smile on his face. Papi keep slugging and #redsoxnation keep the faith. he's having a hot May.